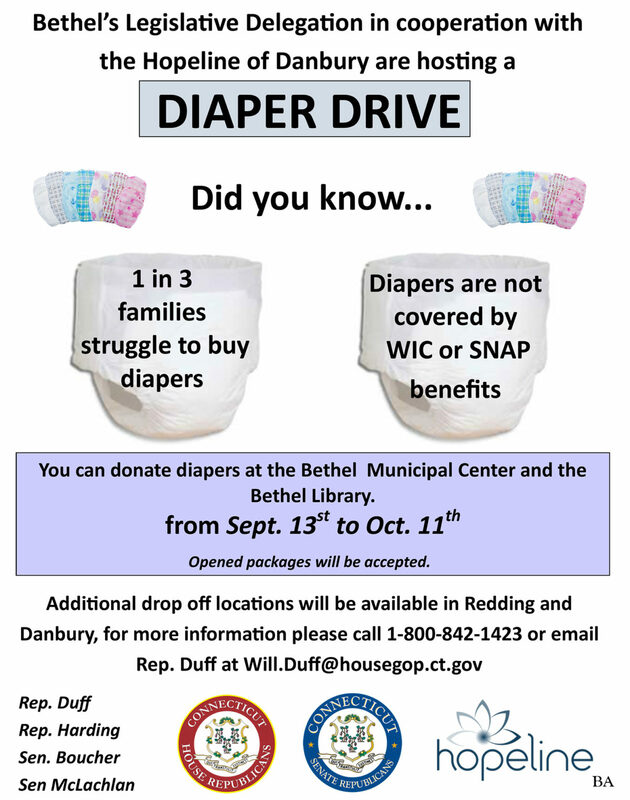 BETHEL – State Representatives Will Duff (R-2) and Stephen Harding (R-107) along with State Senators Toni Boucher (R-26) and Michael McLachlan (R-24) in cooperation with the Hopeline of Danbury will be hosting a town-wide Diaper Drive from Sept. 13th to Oct. 11th. 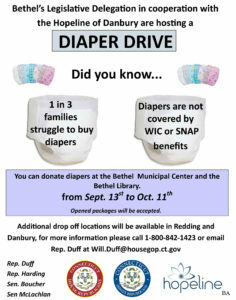 The Bethel legislative delegation put together this month-long diaper drive with Hopeline after for in-need Bethel families after learning that diapers not covered by Supplemental Nutritional Assistance Program (SNAP) benefits. According to state statistics, a month’s supply of diapers can cost over $100. Unfortunately, the vast majorities of licensed day care centers do not accept cloth diapers, and require parents and caregivers to provide a steady supply of disposable diapers. Most people living in poverty do not have affordable access to washing facilities. Furthermore, most coin-operated laundromats do not allow customers to wash cloth diapers for health and sanitary reasons. Additionally, most low income parents can’t afford a membership to a discount club like BJ’s or Costco where diapers are less expensive.